Santhiya Koh Phangan is a secluded piece of paradise – and a favourite among couples who seek the perfect destination wedding venue. This idyllic resort is situated on Koh Phangan’s north-east coast, at the exclusive bay of Tong Nai Pan Noi. Think turquoise ocean, exotic jungle backdrop and fine white sand. 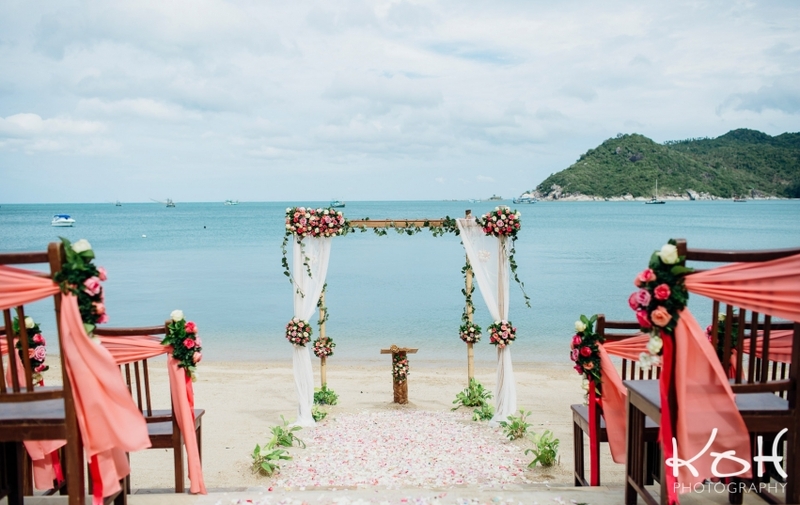 A stunning wedding and honeymoon location for those in the know in Thailand! Lilia was a very joyous bride. 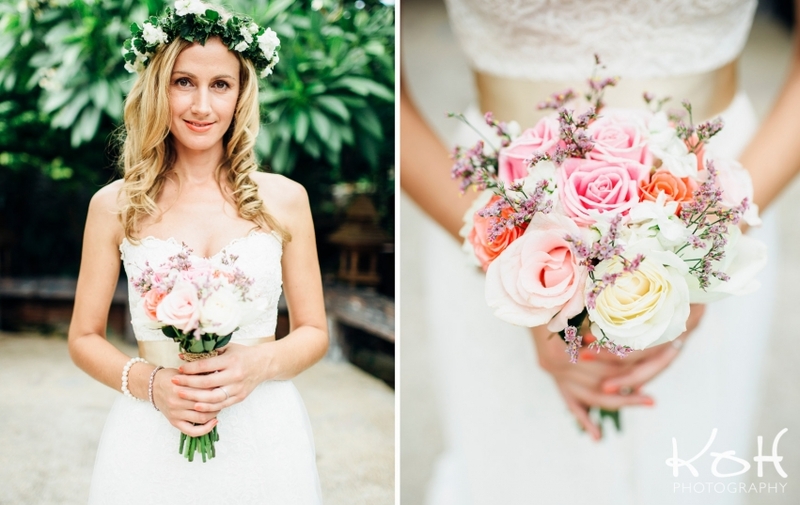 I loved her flower garland in her hair, it really made her features shine out on her wedding day. Sascha was, I must say, a very dashing groom in his quirky bow-tie with his big, wide smile. It was a great pleasure to capture these special wedding moments in photographs – it is a very priviliged position to be a wedding photographer. So much joy and love to capture! Lilia and Sascha’s intimate wedding party had lots fun when the ceremony was complete. There were many heartfelt hugs and more than a few glasses of champagne to toast the new bride and groom! Thai officials accompanied the happy newlyweds to oversee the signing of the wedding papers, making it a legal event in Thailand, and also a wedding that is recognised internationally. The wedding continued on the beach with some great opportunites to take a few moments out with Lilia and Sascha – as the reality sunk in that they were now man and wife. These are the photographs I always love the most, where you can see the bride and groom exude so much real emotion! And of course the Thai landscape is a dream come true for some iconic couple photography to treasure. It was a delight to be the wedding photographer for Lilia & Sascha’s Santhiya Koh Phangan wedding. Such a wonderful playful, couple and a great group of wedding guests, as quirky as them! Santhiya is a beautiful location for a destination wedding. If you, too, are thinking of getting married in Thailand, please don’t hesitate to contact Koh Photography to discuss all your wedding photography needs.